config Configuration directory, including port number, etc. We can use the default for beginners. assets: Place some images, such as logos. components: A component file is placed in the directory, you can use it. 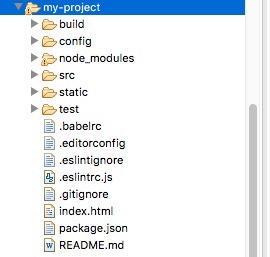 App.vue: The project entry file, we can also write the component directly here instead of using the components directory. main.js: The core file of the project. static Static resource directory, such as pictures, fonts, etc. .xxxx file These are some configuration files, including syntax configuration, git configuration, and more. index.html Home entry file, you can add some meta information or statistical code.